I think that in Windows 7, the default DPI setting is always 100%; that in Windows 8.x, the default DPI setting increases to 125% when the vertical resolution is more than 1080; and that in Windows 10, the default increases to 125% when the vertical resolution is 1080 or more. I still have this huge login window which covers almost my entire screen. It scales normally when I scale everything down to 100% (Win 10) but then everything else is nearly unreadable. So I switched back to the recommended 125%. I figured out it has something to do with dpi awareness. I don't know how to tell the login window to scale at 100% only without scaling everything else too. There are two windows: first a nearly full white one with GuildWars2, the ArenaNet Logo written in it which initializes and which is as small as before but then the login window appears which now is a giant one. I've turned off DPI scaling, but my login window (where I enter my username/password) is still HUGE, it also goes a little below the taskbar, so I always have to move it up. How do I get it back to normal size (the way it looked before the update)? I love the DPI scaling. I can finally use my display @ 4k. I set the DPI to 150% and it fits just as if I was using 1440p 100% scale. After the patch, I'm still seeing fuzzy UI text when "Interface Size" is set to anything besides Normal. Any word on a fix for that specifically, devs? Why is the launcher covering 75% of my screen? I can disable the DPI scaling in-game but the launcher is still...well...launching in absolutely massive size. Launcher is still huge. Still no Fix? Please allow the setting to save instead of turning it off every time I launch the game. I am also still seeing a huge launcher window....even though I unchecked the DPI setting in game which fixed my UI size. Although I can't read anything unless I enlarge the UI size, which still brings the hotbar keys back up to large. Why can't we have text sizing separated from the UI elements for our hotbar keys. We can adjust the size of the map and the chat boxes but not the text? Then there is the issue of the launcher being 3/4 the size of my monitory screen. I had set all my pc settings so that I could actually read text at the size I need without making my icons larger (different settings for those). Before the patch my launcher was just fine. But ever since the patch it covers 3/4 of my screen space. What a mess. Update: I also went back to see about adjusting my pc settings and when I adjusted for icon sizes, everything on my screen became extremely small at the 100% setting and I could not even read any of the title texts. It did decrease the launcher size by about 1/5 of the current giant size, but in the process I can't read anything else. So I had to go back and reverse the regular settings so I could actually see things normally, but the launcher is back to it gigantic size. My question is this: Why can't we readjust the size of the launcher without affecting everything else in sight? I'm also having this issue, 5k monitor set at 2560x1440 with DPI scaling off results in a teeny tiny cursor! It's silence all around from the devs. Why? The least you can do is give an update what you are doing about the DPI scaling problem. I ask again ... why can't this change simply be reversed until a fix is in place that addresses the issues that the community have mentioned? Any updates on the blurry UI issue, devs? So I have found a solution for the cursor size, at least for Mac OS users, may be useful for windows, idk. If you go into System Preferences --> Accessibility you can increase the cursor size. This will increase it in both the normal usage and in game, but at least I can find it now in game! Thanks for this, for mac 32bit users you need to press alt from the finder window to be able to access 'Library', from there application support from the 'Go' menu, then go to application support, GW2 > p-drive > User > Application Data > Guild Wars 2 & then open GFXSettings.Gw2.exe.xml and make the change. Still getting fuzzy text. Any updates on a fix? Same here. Seems to be a hard on to crack. I hope they don't just leave it like this and claim "good enough". OGDeadHead, what resolution are you running? Someone mentioned also having1280x1024 (which is what I'm using), so part of me fears it's just an "oh that's an inferior resolution, not many people are using that so we won't bother with a fix" stance. 1680x1050. 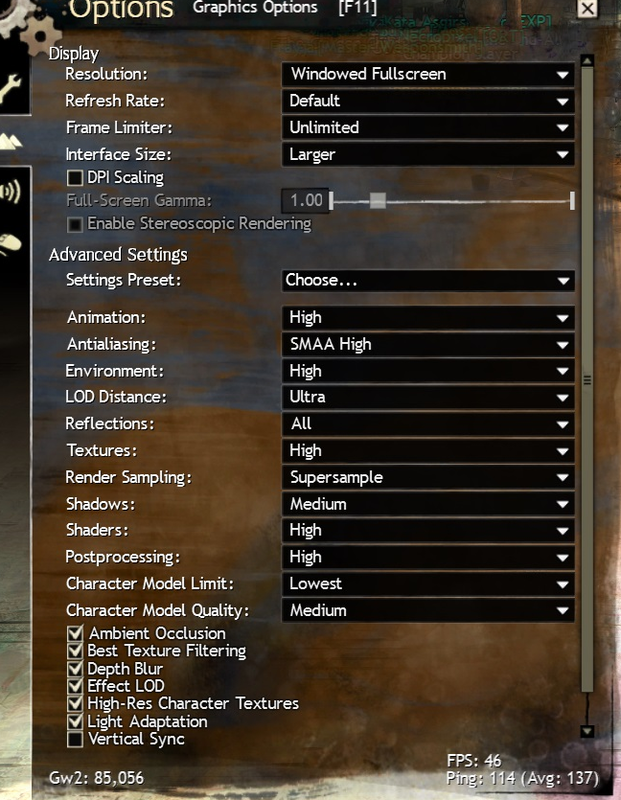 Since I had no issues with this prior to the dpi scaling release, it's a fact that Anet messed something up when they introduced this, it's that simple. It would also be intersting to know if they are going to leave it as it is, or if work is being done to fix this. I'm running 1920x1200 which is, like 1680x1050, a 16:10 aspect ratio instead of the now common 16:9. So I guess that puts us pretty low on the priority list. Right now I can choose between straining my eyes looking at small font, straining my eyes looking at blurred font or taking a break, which is what I've opted to do. I would really like to know this as well, vs. nothing but the ongoing silence we've had so far. Frustrating... I still have fuzzy UI text after the patch, despite whatever UI/DPI revisions were made. Should I just assume this bug is never going to be addressed? Hey ANet, when are you going to do something about the microscopic mouse issues? Resolution 1680x1050, UI size small or BIG = fuzzy text. Bug introduced with the DPI scaling patch, and it's been bad ever since. An official response would be nice just to let us know this is how it will be from now on, or if you are actually working to fix it. Another week, another non-reply to the fuzziness issue. This thread was (ostensibly) created to gather feedback; what's the point of that if the discussion is only one-way and nothing ever comes of it? My frustration is ongoing. Another patch, still no fix for the fuzzy UI text or any dev comments even acknowledging the issue. Indeed. Well I guess we can thereby conclude that a 16:10 aspect ratio (and possibly others) is from now on not officially supported in this game, and since we're such a small group, if the Steam hardware survey is anything to go by, they most likely won't put the resources in to fix this. DPI Scaling works nicely on 2560x1080 resolution! So this DPI scaling change is great for high resolution users but its instability is causing full system lock ups for me. I have to disable the scaling in GW2 options then check override scaling by application in the .exe compatibility menu in Win 10. Even then the game hiccups from time to time. When the elements scale up they dont have new textures, the UI is just stretched which looks horrible. I play at 1440p for better definition of visuals not worse. So i turned it off and am happy with a smaller UI and more screen to see whats going on. Submitted a ticket about the DPI scaling locking up my machine. 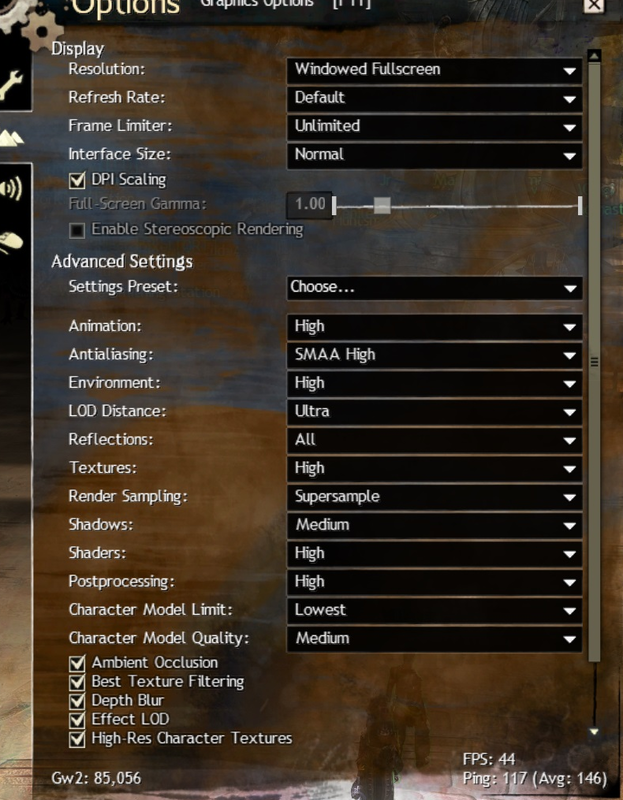 Edit: Yes it did work for me when I checked "DPI Scaling" in the graphics menu within GW2 running two 1440 monitors. Everything got larger without increasing the actual UI size. Currently we believe that display aspect ratio and the fuzzy text problem are unrelated. We have an active work item tracking the text issue, but at the moment there is nothing new to share. The state of DPI Scaling is now saved in a timely manner (among other toggles that were previously not triggering a save). The launcher should now center itself correctly when scaled. For Mac users, the cursor being small when not using DPI Scaling matches the behavior of Windows. Please post your exact DPI setting along with your OS and OS version. On Windows 10, this can be found in Display Settings; on Windows 7 & 8 it's under Appearance and Personalization; for Windows XP it's found under the Advanced part of Settings in Control Panel. On Mac, whether your display is Retina, and what macOS version are probably sufficient. Windows' DPI setting is "Smaller - 100% (default)"
Resolution 1680x1050. Fuzzy text only seen using interface size other than Normal in game. My resolution is 1920x1200. As far as I can tell, the fuzzy text only appears on the Gem Store/Trading Post, not on any other UI parts. It doesn't matter if I have the in-game DPI option checked or unchecked. I usually have my interface size on "small". Blurriness goes away when setting it to "normal". I want to keep it on small, so I hope it can be fixed. I'm running windows 10 home, 64 bit. Resolution is 3840x2060, and the scaling in windows is set to 150%. I took a couple screen shots, and cropped them down to just the settings screen. In one case, dpi scaling is set with normal interface, the other is no scaling but larger interface. To me, the no scaling fonts looks sharper, even though it is smaller. If one takes the image and zooms in, one can see some bits ghosting on the text. It is like someone suggested - with scaling, the font is being rendered at one resolution and zoomed up, in the other, it is properly rendered. I'd actually play with dpi scaling turned off (as the font sizes are not that far apart), but what really is helpful to me with dpi scaling is the size of the cursor and the size of the mini map. I'm wondering if you're able to reproduce this issue at all? I'm also wondering why this can happen even though you don't enable the DPI scaling feature ingame, what other things did you change realted to this in the "DPI scaling"-patch that introduced this bug? Any more info or updates that can be shared regarding the fuzzy UI? Also an issue here, I was hoping this would be fixed by now. I was hoping this would be fixed by now. For anyone continuing to have fuzzy text issues / Please post your exact DPI setting along with your OS and OS version. The fuzzy UI issue still persists for me after today's patch. I think it will persist until they explicitly say it's fixed. I have the impression it's not very high on their priority list.